At the COMSOL Conference 2017 Rotterdam, simulation specialists from across Europe (and some from as far away as Chile and South Korea) showcased their innovative research and modeling work. Among the many excellent user presentations, several made a special impression and were recognized with awards. Read on to learn about the top papers and posters from the COMSOL Conference 2017 Rotterdam. The many papers and posters presented at the COMSOL Conference 2017 Rotterdam featured a wide variety of topics, such as high-power fiber lasers, open-cell polyurethane foams, and concrete gravity dams. Three papers and three posters were chosen to receive Best Paper and Best Poster awards by the conference program committee. 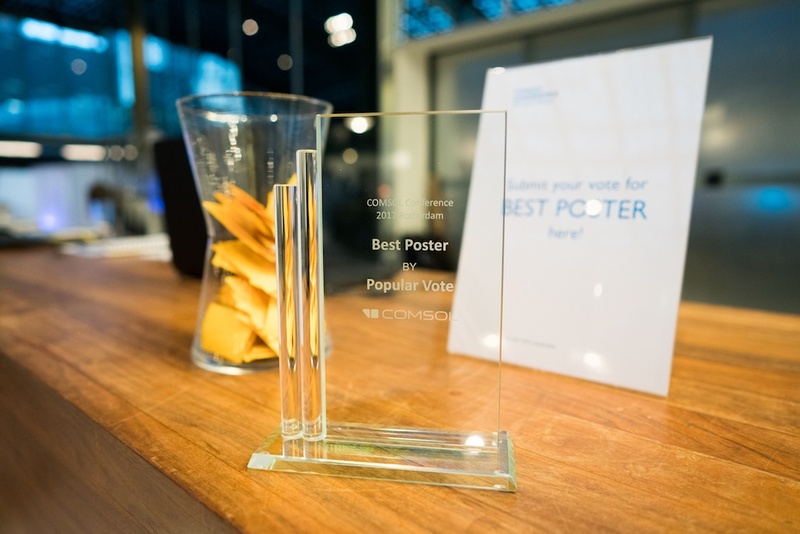 At the conference, attendees also voted for their favorite poster to receive the Best Poster by Popular Vote award. Some of the COMSOL Conference 2017 Rotterdam award winners with Svante Littmarck (far right), CEO and president of COMSOL. The first Best Paper award was given to J. Schüttler, B. Neumann, S. Belke, F. Becker, and S. Ruppik from Coherent-ROFIN for “Virtual Long Term Testing of High-Power Fiber Lasers“. 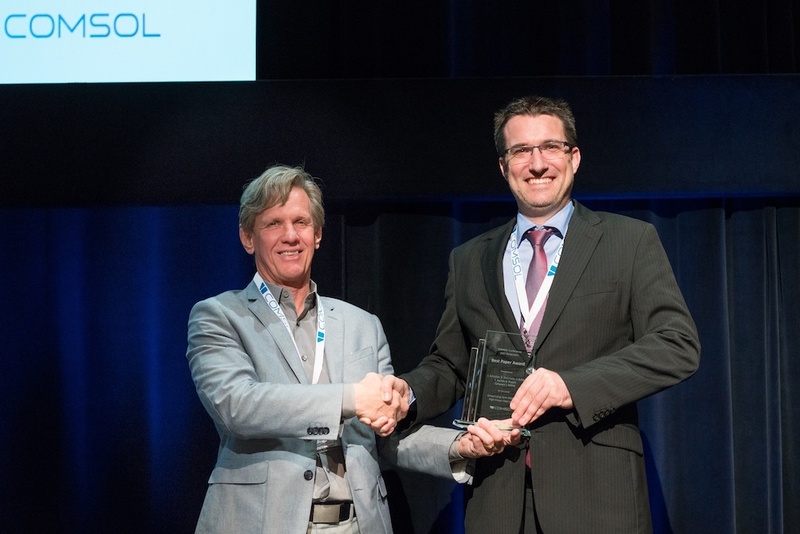 J. Schüttler (right) receiving the Best Paper award from Svante Littmarck (left) at the COMSOL Conference 2017 Rotterdam. Over the past few years, high-power fiber lasers have significantly increased in performance. This power scaling has led to a number of challenges, as the effective output of many fiber lasers is limited by the effects of transverse mode instability and photodarkening of the fiber. To study the performance of a fiber laser over its typical lifetime, Schüttler and his colleagues used a numerical approach in the Wave Optics Module, an add-on product to COMSOL Multiphysics. Their model accounts for the effects of mode competition, mode energy transfer, laser gain, bend losses, as well as the actual refractive index distribution and doping profile of the fiber. With this model, the team performed virtual long-term tests by simulating 10,000 hours of laser operation in just a few hours of computation time. Another top paper is “A Multi-physics Study of the Wave Propagation Problem in Open Cell Polyurethane Foams” by M. Brennan, M. Dossi, and M. Moesen of Huntsman Polyurethanes. Many noise and vibration damping materials are made of polyurethane foams, which have a porous random microstructure with cells that are usually partially open. Mechanical waves travel through the solid viscoelastic frame via structure-borne vibration transmission, while airborne flow carries acoustic waves through the pores. These waves are strongly coupled, so in order to understand wave propagation, solving for the fluid-structure interaction (FSI) is important. The researchers at Huntsman Polyurethanes used the COMSOL Multiphysics® software to study wave propagation in partially open porous foams. With the CFD, Acoustics, and Structural Mechanics modules, they modeled the coupling of the airborne and structure-borne transmissions. They also looked at how different degrees of strain affected the FSI in the foam structure. 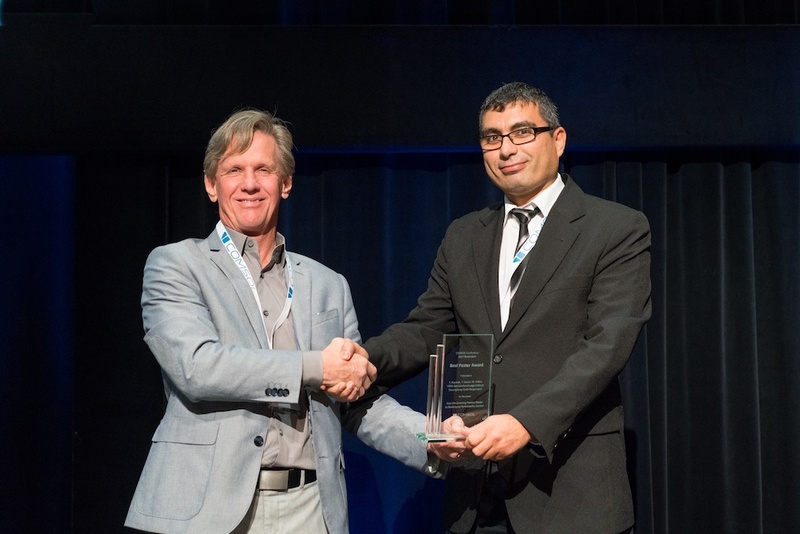 A. E. Alshayji and R. I. Bourisli of Kuwait University were also given an award for “Natural Convection Effects on the Solidification in Cylinders at Different Filling Percentages“. The solidification of a fluid in a partially filled cylinder has applications in a number of industrial processes. The performance of these systems typically depends on both the behavior of the fluid as it freezes and the level of filling in the cylinder. To gain insight into such systems, Alshayji and Bourisli examined how different levels of filling affect the solidification process of a fluid in a cylinder. COMSOL Multiphysics was used to solve for the mass, momentum, energy, and phase equations, as well as to account for various combinations of the Rayleigh and Prandtl numbers. While not discussed in this paper, the researchers are investigating other quantities and parameters of this problem and are studying 3D cases where turbulent flow is present. Three of the Best Poster awards were chosen by the conference program committee, and the other two posters were given Best Poster by Popular Vote awards. The first award for Best Poster went to Y. Kaymak, T. Hauck, and M. Hillers of VDEh Betriebsforschungsinstitute GmbH and Shuangliang Clyde Bergemann GmbH for “Iron Ore Sintering Process Model to Study Local Permeability Control“. Svante Littmarck presenting the Best Poster award to Y. Kaymak (right). Permeability bars are used to improve the efficiency of the iron ore sintering process. These bars locally increase the porosity of the bed of raw materials, which impacts the local flow rates, local course of combustion, and temperature field in the bed. The researchers developed a transient 2D model to study how various permeability bar configurations affect the sintering process. This model solves for the reactions and flow in the porous bed, the results of which were validated with laboratory and industrial measurements. C. C. Huang, T. Liu, and F. Faassen of Teva Pharmachemie B.V. received a Best Poster award for “Sensitivity Analysis of CPP’s for Solvent Removal Process of an API-Polymer Based Nano-Suspension“. 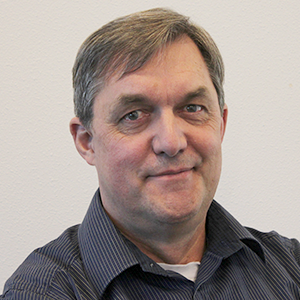 Currently, Teva Pharmachemie is developing a nanoparticle product that has a weak bond between the active pharmaceutical ingredient (API) and polymer. The nanoparticle is highly sensitive to temperature, mechanical mixing, and the rate of extraction/evaporation during solvent removal. The aim of this work is to analyze how the sensitivity of critical process parameters influences the solvent removal process during the manufacturing of the nanoparticle. From their model, the researchers learned which factors are the most important and which ones should be maximized or minimized. The simulation results also showed good agreement with experimental data, indicating that this model can provide critical information to help make informed decisions. Another Best Poster award was given to A. De Falco, M. Mori, and G. Sevieri of Pisa University and Florence University for “Frequency Response Analysis of Soil-Structure Interaction for Concrete Gravity Dams“. This poster describes a simulation approach for analyzing the soil-structure interaction of a concrete gravity dam. The research team investigated the dynamic response of the dam to earthquake excitation and demonstrated the advantages of accounting for the semi-unbounded terrains. To this end, they studied how different modeling approaches compare in terms of frequency response. The final count for the Best Poster by Popular Vote award resulted in a tie. The first of these posters is “Biologic Tissues Properties Deduction Using an Opto-Mechanical Model of the Human Eye” by A. V. Maurer, D. P. Enfrun, C. O. Zuber, and R. Rozsyno of Kejako SA and the University of Applied Sciences and Arts of Western Switzerland. The researchers used a 3D model to measure the material properties of eye components. As current in vivo imaging technologies cannot evaluate these properties, this research could shed light on how aging affects the eye and thus help in the development of new surgeries. The poster shows how the model can deduce the material properties by reverse engineering in vivo images. The Best Poster by Popular Vote award. The other Best Poster by Popular Vote award was given to C. Hollenbeck, Z. Jildeh, P. Kirchner, and T. Rydlewski from Imagine Engineering GmbH for “Multiphysical Simulation of an Induction Sealing Process for Cups with Laminated Aluminum Foil“. Thermoformed cups, like those for yogurt, are typically sealed with laminated aluminum foil via contact heat from a hot stamp. In this work, researchers use simulation to investigate an alternative sealing method based on induction heating. 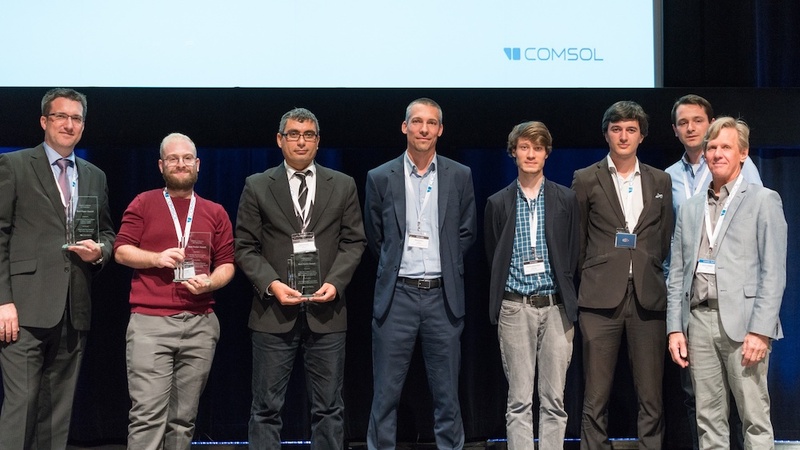 We would like to thank everyone who presented their research at the COMSOL Conference 2017 Rotterdam and congratulate all of the winners of the Best Paper and Best Poster awards. It was a great experience learning about your innovative work! Browse more presentations from the COMSOL Conference 2017.